This June started with a spate of miserable weather: daily highs 20 degrees below normal for the season and very chilly nights. I had to reinstate my heavy sweaters and turtlenecks, close all the windows, and defer my eager anticipation of summertime meals. I feared we wouldn’t see local corn until August. My only consolation was the chance it gave me to revisit a few good cold-weather dishes that I hadn’t gotten around to making earlier this year. 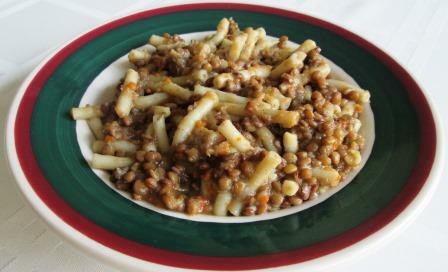 Pasta with lentils, from Tom’s and my book The Seasons of the Italian Kitchen, is one favorite. (The recipe is in the “Winter section,” of course: ridiculous to crave this warming, rib-sticking dish in June!) Entirely meatless, it develops rich flavors from the combination of a few simple vegetables and olive oil. Expensive lentils taste better than cheap lentils. With lentils more than any other legume, the price differential between run-of-the-mill stock and premium stock really reflects a perceptible quality difference. 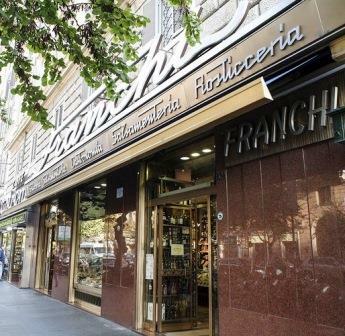 Whenever I’m in Rome I stock up on Castelluccio lentils at Franchi, a wonderful specialty food shop in the Prati district, which is also the one place where I can reliably get my favorite brand of mostarda di Cremona (fruits in sharp mustard syrup) for serving alongside bollito misto – another winter dish that was looking very attractive early this month. However, I digress. Back to the lentil cooking. For four generous servings, I use ½ pound of lentils, picked over (to eliminate the occasional small stone), rinsed, and drained. I put them in a large pot with ½ cup of finely chopped carrot, ½ cup of finely chopped celery, 1 cup of finely chopped onion, 2 teaspoons of salt, and cold water to cover. This cooks slowly, covered, until the lentils are tender – usually about an hour. I check every 10 minutes or so, and as the lentils absorb their water I add more from a kettle that I keep simmering on the stove. When the lentils are done, I add 5 ounces of imported Italian pasta. My recipe calls for bucatini broken into 2-inch pieces (for a contrast in shape with the lentils), but any short pasta variety will do. I re-cover the pot and keep cooking until the pasta is done, again adding hot water as needed to keep the dish moist. I like the final consistency to be about that of a thick soup. The essential last step is to stir in ¼ cup of olive oil, salt to taste, and a generous quantity of freshly ground black pepper. Here’s one place where I do use extra-virgin olive oil – though, again, you don’t have to. No grated cheese is called for, but at the table an extra lacing of olive oil and pepper couldn’t hurt. No sooner had Tom and I eaten the dish than warmer weather started to come in. Could it have been apotropaic magic? Maybe we’ll get local corn on time this summer, after all. P.S. 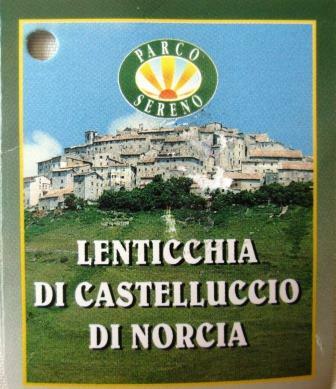 The back of the lentil label pictured above has a little verse called Il detto di nonno Sirio (Grandpa Sirio’s Saying), which gave me a chuckle. Here it is in the Italian, followed by my translation. Tra le lenticchie io son la migliore. Per il vecchietto il bastone di legno. Among all lentils I am the best. And a strong walking staff to help oldsters live. Oh, my. You and Tom do eat well. Hello there. I do appreciate your recipes. You are a wondeful writer/teacher. We all learn so much from your writing. I’ve mentionned it before and It’s my pleasure to do it again. All my best to you and Tom.